As I’m finally eating a slice of this, my favourite fruit cake, post Christmas, I’m still not quite sure what got me into baking this cake each year. Mum might remember, but all I know is that I think she baked it initially, but fairly early (probably in my early teens) I remember baking one each year; and soon after started baking them for friends and colleagues of my parents. 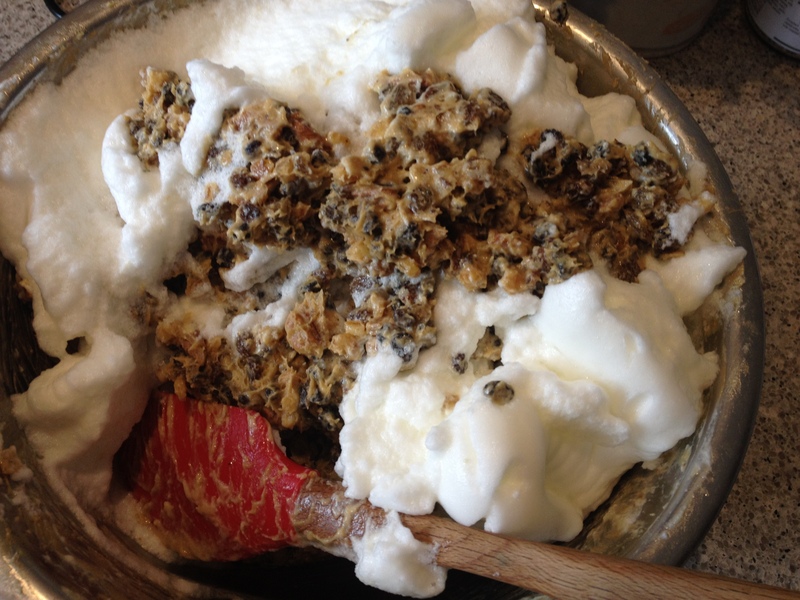 It was a huge production back then: for each cake mixing more than three kilos of dried fruit and nuts with flour; mixing more flour with spices ground to powder in a mortar and pestle; creaming nearly half a kilo each of butter and sugar (by hand with a wooden spoon! ); then separating and beating fifteen eggs, before finally folding all these components together. I used to bake the cake in a huge round tin – it must have been more than 12 inches across – for about six hours. We only had a wood burning stove, so it was Mum or Dad who fed the fire in the late evening, and then set the alarm to get the cake out in the early hours if I hadn’t got it in the oven early enough. The huge effort involved in this early baking is why I now often include a photo of my beloved stand mixer, as the difference it makes when mixing large batches, let alone whisking 15 egg whites! is just incredible. This makes a huge batch, so by all means halve it if you like, though the cake(s) will happily last for many months. 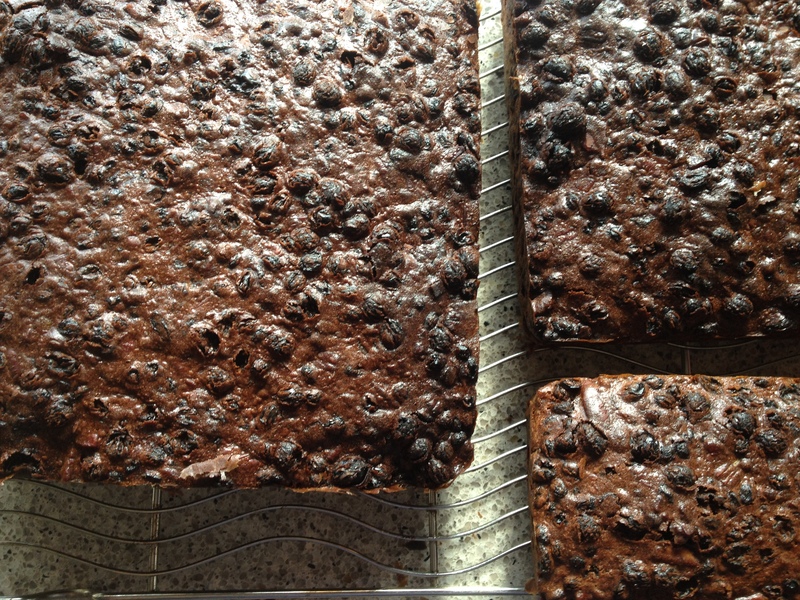 This is an incredibly rich, dark, heavy cake, very different to the other Christmas cake I make, but I highly recommend it if you’re not a fan of light fruit cake. Heat oven to 135C, and place a shallow pan of water in the bottom. Grease tins and line with a couple of layers of baking paper. 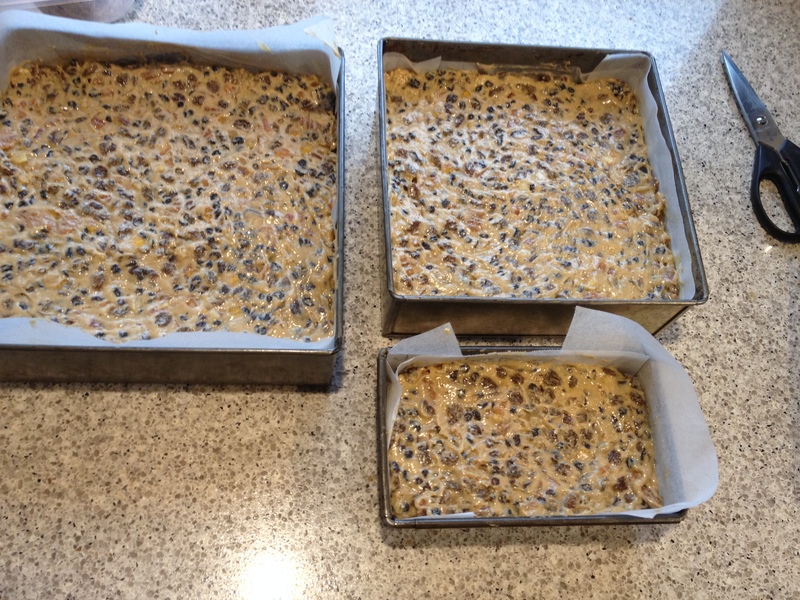 This makes over 5kg (12 lb) of cake, so you can use a range of tins – two large square tins (23 and 25cm), or three 20cm square tins, or any combination with an area of about 1100cm2 (that’s 175 square inches for those who find that easier!). 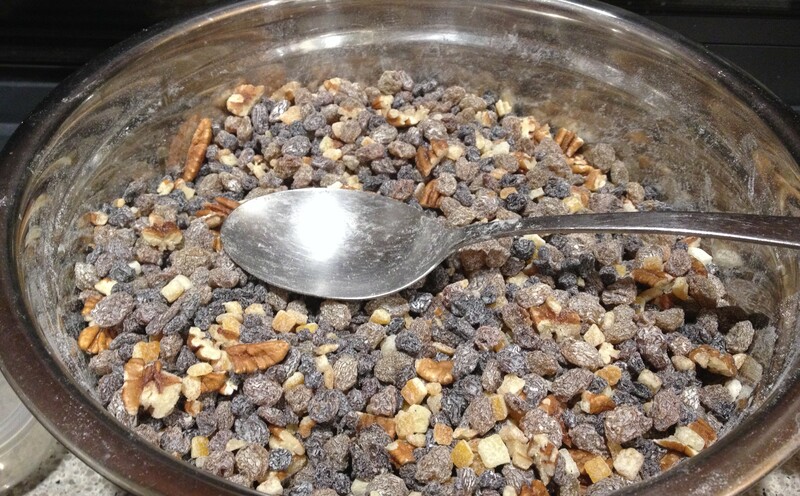 Combine currants, raisins, peel and pecans in a large bowl, and toss together with 100g of the flour. Make sure any clumps of fruit are separated, and each piece is coated with flour. Grind the spices to powder, and stir together the remaining 400g flour, spices and salt. Cream the butter and sugar, preferably in a stand mixer. 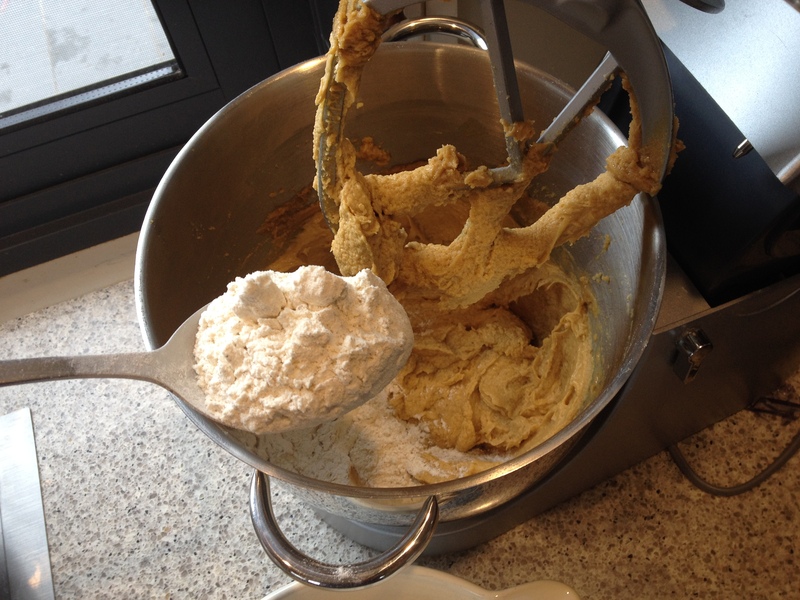 If you’re mixing by hand, make sure the butter is very soft. Separate the eggs, and beat the yolks into the butter and sugar. Mix in the flour, adding alternately with the bourbon. Switching to a big wooden spoon or spatula, fold in the fruits and nuts, ensuring there are no pockets of flour or butter mixture at the bottom. In a separate bowl, beat the egg whites until stiff, then fold them thoroughly into the mixture. For this stage I usually switch to the oldest implement there is – my (clean) hand! Spread into the lined tins, levelling the mixture with a slight dip towards the centre so the top is flat when it rises. 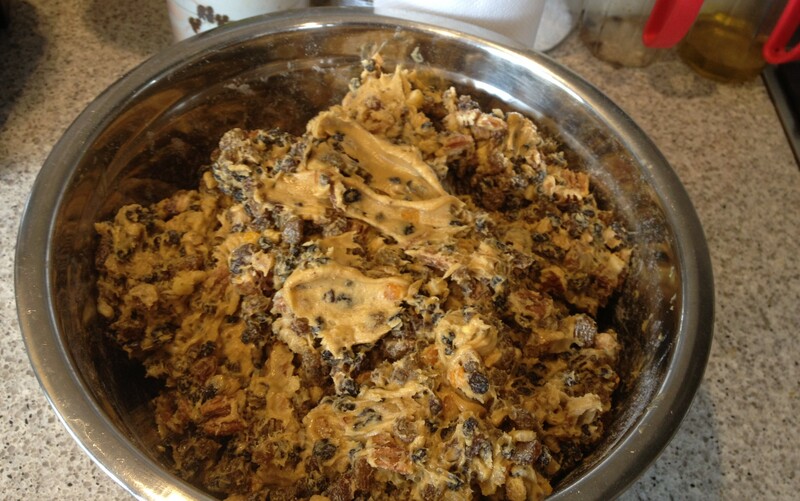 WOW, this is very much like my grandmother’s recipe for Christmas cake. She made it, my mother made it and now i’m in charge. None of us ever whipped the egg whites and added them separately though. Does it make a huge difference? The cake is so heavy to begin with i can’t imagine the whipped whites doing much. I may have to try it and see! I always have a hard time judging the “doneness” of these cakes too. I use the old fashioned square wedding cake pans from Grandma but i think i’d have better luck with regular round or square cake pans. Though i never have trouble finding people to eat the yummy burnt edges! Thank you for sharing! Ellen, the mixture definitely looks lighter after you stir the egg whites in – I usually use my hand to fold them 🙂 – but I haven’t ever tried without… I have to confess I’m usually a bit slack with the three layers of newspaper around the outside etc, which would probably help a lot…thanks for stopping by!